November did not only kick off the beginning of Thanksgiving feels and festivities, but it also marked the start of the annual mustache and beard trend. Every November, thousands of men spend the month growing mustaches and beards to raise awareness of men’s health issues such as prostate and testicular cancer, poor mental health, and physical inactivity. Many beard and mustache growers, as well as men and women supporters have taken to Twitter to reveal their own journey and support of those growing facial hair. The majority of tweets feature pictures of men flaunting their facial hair or reasons why they are participating in Movember, with the addition of a link to their fundraising site and the hashtag “#Movember.” Many tweets by women who are unable to grow facial hair talk about the importance of Movember and ask for donations. Some tweets, however, show people’s opposition towards Movember. Many of these tweets are not in opposition of the cause, but of the growing of beards and mustaches. This might stem from the fact that some people, especially women, may be unaware of Movember’s cause. The good thing about the hashtag is that if someone is unaware of the cause for Movember, they can easily figure it out by viewing other people’s tweets. That lil flip @AaronRodgers12 just did was slick. However, his decision to not do #movember has me greatly disappointed and concerned. With the increasing amount of information, news stories, and social media posts spewing out these days in milliseconds, finding a “good” story may seem physically impossible. For me, a college student used to reading hundreds of stories throughout my career at Syracuse, stories seem to all mesh together in my memory unless they have some sort of element to help them to really stand out among the rest. So, what exactly makes a “good” story? Anything with pictures helps to grab my attention. Just like any normal little kid would only choose a children’s book based upon the pictures inside of it, I prefer to choose and read a news article or story with pictures as well. Therefore, once I am actually reading the content within the story, I can look at the pictures for further insight about what it is about and what occurred. 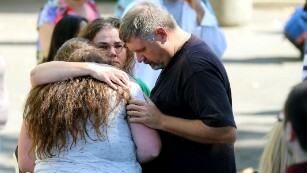 An example of the use of pictures helping to develop a story is apparent in the CNN article “Oregon shooting hero tells gunman, ‘It’s my son’s birthday today. '” The article talks about how Oregon shooting good-guy Chris Mintz told the shooter that it was his son’s birthday after being shot multiple times. The use of pictures not only breaks up the large amount of text throughout the article, but also helps me to identify with Mintz by seeing what he looks like, and seeing how other people reacted to the tragedy. 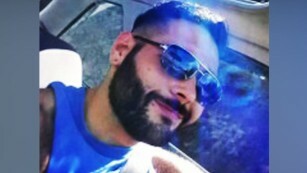 CNN included this picture of Chris Mintz in its article about the Oregon shooting hero. I might be a sucker for an inspirational and happy-sad story, but emotional elements of stories really do grab my attention for a good reason. A story without any emotional, touching, or thought-provoking elements may be written well and have all of the facts needed to get a point across, but will not make me remember it long afterwards. Therefore, the best stories are the ones that make me feel and remember something for a very long time. An example of a story that has emotional elements which will remain with me for a long time is one that TODAY featured in an article on its website. It is about a doctor who discovers a woman crying in the hospital while undergoing cancer treatments. He later finds out that the reason that she is crying is because she believes that she spread her cancer to her pet dog, Wally. The story proves that the woman was more concerned with the health of her dog than she was with her own health. All in all, finding stories with pictures and a strong emotional element make me jump for joy. Finally, a breakthrough and a breath of fresh air in this over-cluttered news story, social media story, and story-story world! Let’s just hope that more authors remember to create “good” stories, rather than rush to get out information quickly. 2015 has been the year of social media campaigns, and for good reason. Social media campaigns are not only are easy to produce, but they are super easy to get a message across to a large group of people as well. One campaign that has truly stuck out to me within the past year is Nike Women’s #betterforit initiative. The campaign, which was launched in April 2015, revolves around a commercial that showcases many young women trying to do physical activity. From a yoga class to a spinning machine to a weight room to a marathon, the commercial reveals the inner struggles and thoughts of female athletes, and those who may at times be intimidated to exercise in a crowd. The commercial is framed around “real” females who want to work out, and how many females unjustly doubt themselves and their abilities while working out. Nike has promoted short clips of the commercial, and the use of the hashtag #betterforit via Twitter, Facebook, Instagram, and Tumblr to create a social media campaign that encourages females to share their exercise accomplishments via pictures, videos, and writing. This campaign is a very strategic way for Nike to get people to go out and buy its clothing, without saying anything about apparel. To me, Nike has many objectives for this campaign. A major, and obvious objective is to get people to talk about Nike as a company on a completely digital entity. The PR department at Nike knew that by creating a social media campaign on multiple different social media platforms, with a fairly easy to remember hashtag, the company could spark conversation about women’s fitness easily and with little cost, all while still connecting Nike’s name to the campaign. Social media allows it to be so easy to converse about events and occurrences, and to respond to one another’s posts. Plus, people love to talk about themselves and to share their own accomplishments, and what better excuse to do so than with a social media campaign? Nike also had the objective of creating a conversation about the fact that thirty-six percent of women admit that anxiety has prevented them from working out in a public gym, according to a recent study by Curves Australia. This clearly is not a good statistic for a company that markets fitness gear to women. Therefore, the #betterforit campaign shows that while all women have doubts about their gym and physical performance, they should still erase their doubts and continue to motivate and push themselves and work out (and ultimately purchase Nike clothing). The final objective is to create a campaign in which “real” females are showcased, rather than the company’s previous campaigns that featured world famous athletes and stars such as tennis guru Serena Williams, supermodel Karlie Kloss, and soccer star Alex Morgan. Therefore, Nike’s goal is to make the commercial and campaign more relatable to all women, and to show that all normal women can push themselves to exercise no matter what the circumstances are. Nike’s PR and marketing department have been very strategic about the planning and implementation of this social media campaign. One major strategy that the company used was to debut the commercial during the spring MTV Movie Awards, an award ceremony that always draws a large audience. Therefore, while people were cozied up watching their TVs to hear the news that their favorite movie received an award, they watched the commercial that launched and promoted the campaign. This clearly was smart because numerous people saw the commercial, and therefore it immediately sparked the conversation about women’s fitness. I personally think that the strategy of creating a campaign based around pictures and videos was genius on Nike’s part. As earlier stated, people love to talk about themselves and their accomplishments. However, they not only love to talk about themselves, they also love to show real results through the sharing of images. Through the campaign people can do just that, and many times Nike Women’s official Twitter and Facebook accounts will respond to posts with encouraging comments via social media. I also think that the strategy of “show not tell,” or basically how Nike never said to purchase its apparel but instead shows images of people wearing Nike apparel and using the Nike fitness app, makes the messages of the campaign more credible to its audience. If the commercial and social media campaigns just showed images of people saying to use the company’s products, even if they did touch upon the “real women” aspect, people would not be as moved and motivated to actually work out. While this campaign is still ongoing, and therefore has not shown any long-term results, it has revealed some insights and short-term results about how a social media campaign functions, and its strengths and weaknesses. The campaign has so far shown a multitude of strengths and positive outcomes. It has resulted in countless tweets, retweets, and other social media likes and comments about fitness and motivation. It has also started a conversation between social media users about the impacts of living healthy lifestyles. Lastly, the commercial has reached over 8 million views on the company’s YouTube channel, therefore reaching a fairly large portion of people worldwide. While most of the results have been positive so far, there have been some negatives. The majority of negative feedback around the campaign is that the commercial, which the social media campaign was built around, only showcases attractive, fit women. People took to Facebook to comment on the fact that while the commercial and campaign aim to address the “normality” of most females who exercise, they do not show “real” women. Kimberly Rae: I like the message behind this ad but why is only one body type represented in this? Riki Taylor Juarez: Awesome ad. Now do one for people who actually look out of shape. Jennifer Guerrero also addressed the fact that many “real” women cannot afford to purchase Nike apparel. “Now lower the prices a little so real women can buy your stuff,” said Guerrero in a Facebook post. Most Nike shoes range from $60-$200, and its clothing tends to range from $45-$130. Therefore, it is true that many “real” women, who may already have to focus on their careers and families, may not wish to spend so much money on fitness apparel. For that reason, I think that Nike should have created a large “#betterforit”discount or sale section online and in stores, and shown “real” women, not skinny commercial actresses, shopping from the section in the commercial. To me, however, the positive results from the #betterforit campaign outweigh the negative results. Even if the campaign does not feature “real” women, it still gets the message across that women should not be ashamed to go to the gym, but instead should push themselves to work harder. We live in a world in which content is continuously thrown at everyone. Whether you like it or not, advertisers and marketers are constantly informing you of the “next best thing”, or something that companies think you should know about or purchase. We see and hear messages everywhere: on billboards while driving to work, while working out to your favorite Pandora playlist, and while scrolling through Facebook to see what your friends posted following a crazy weekend. Even social networks like Instagram, which originally only provided people with pictures from those whom he or she followed, now “sponsors” content from marketers who are trying to express a message through a picture or video. Even though countless messages are being sent out each day, only a select few grab the attention of the targeted audiences. For example, I normally tend to scroll through Twitter on a daily basis. While I follow many accounts ranging from fashion stores to technology sources to the news, I normally scroll past the typical marketing tweet with a link attached to it without even knowing what I am doing. Unless the message is very clever, emotional, or has a very appealing picture attached to it (aka food, puppies, etc.) I normally do not even notice it. While the commercial that airs on TV is only about 30 seconds, AT&T released a longer, four-minute YouTube video that often surfaces on Facebook. The campaign also has a Twitter account, which retweets many messages about the cause. There are so many reasons why this campaign is a genius way to grab the attention of a large audience. It pertains to almost everyone in the 21st century. Since it begins with an everyday feeling and setting, it helps the audience to relate to what is going on in the video. It is hard to look away from, or scroll past. You may want to spare yourself from seeing an innocent child get into a tragic car accident, but you can’t. You want to know what happens, and by the time the accident occurs you know what the message is. It is celebrity endorsed. I know that for me, when I see a celebrity’s tweet, I want to read it to see if it contains any gossip, Twitter fights, etc. By the time that you actually read the tweet, the message is across. And so many people see the tweet in the first place, because every celebrity has thousands to millions of followers. Short and simple. Grab my attention by promoting what I actually want to see! Have you ever looked up a pair of shoes, and then later that day on Facebook noticed an advertisement for the same brand of shoes? No, it’s not coincidence or fate, it’s a tracking code. This is a borderline creepy but brilliant form of marketing and advertising that easily grabs my attention. Basically, marketers and advertisers use data collection to find out what us consumers are viewing on the Internet, and then promote their products as advertisements on websites that we visit later. As an example, this morning I was shopping online for a poster for my bedroom. 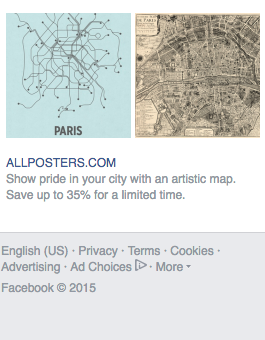 Hours later, while scrolling through Facebook, I came across an advertisement for posters. Obviously, this marketing tool was going to grab my attention, because I spent time earlier in the day looking for the exact thing that it was promoting. And this doesn’t just happen with Facebook. Often times, I can be scrolling through a website that I randomly stumbled upon, and I will notice an advertisement for something that I had researched in the past. More often than not, this redirects me back to the website of the product, and I spend time researching about what the product and its company have to offer. These days it seems almost impossible to get a message across, which can be discouraging to marketers, advertisers, and public relations professionals. No, I’m not saying that I would rather live in the early 1900’s, when most people received messages through the single newspaper that they were reading, or radio station that they were listening to. However, I know that as a future communications professional, I will need to know how to strategically communicate, so that my message does not get lost or ignored due to the incessant clutter. If every form of marketing and advertisement could be sent out through an emotional campaign or form of data tracking, that would be marvelous. Life would be so easy, for both myself as a consumer and as a communications professional. I would never have to sort through all of the clutter to get the message that I wanted to receive, and would know exactly how to grab the attention of my target audience (except I think that in the end my short attention span would even skip over those forms of marketing if there were too many). So for now, I will continue to applaud those marketers and advertisers who somehow grab my attention in a world of excess clutter and overloading messages.